Combine the beauty of CZ birthstone inlays and stunning sterling silver with the personalized touch of a custom made ring, and you would have Apples of Gold's Custom Heart Promise Ring. 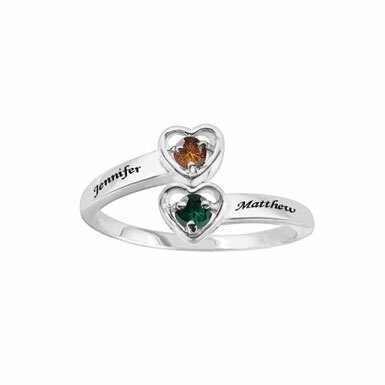 Choose the two birthstones to be used and select two names that can be engraved into the ring. The Custom Heart Promise Ring has a unique two level design that makes it very appealing and the craftsmanship is of the highest quality- making it ideal for every day wear. Discover the beauty and elegance of this personalized silver ring and create a keepsake that will stand the test of time and that will be treasured during and after the engagement. Names can be up to 10 characters each. We guarantee our Custom Heart Promise Ring in Sterling Silver with CZ to be high quality, authentic jewelry, as described above.